The Lisbon trams, once drawn by horses, have a steampunk quality, with their 20th century fittings and polished wood. The vintage cars, built over seventy years ago, sport bright yellow paint. Trams jounce (made up word that best describes the motion) through cobbled streets and narrow alleys, like Mr. Toad’s Wild Ride from Disneyland–with sudden turns, avoiding what would seem to result in an inevitable crash. The tram wheels, positioned at the center of the car and not at the ends, make the trolley seem to float over the tracks. What’s the ride like? 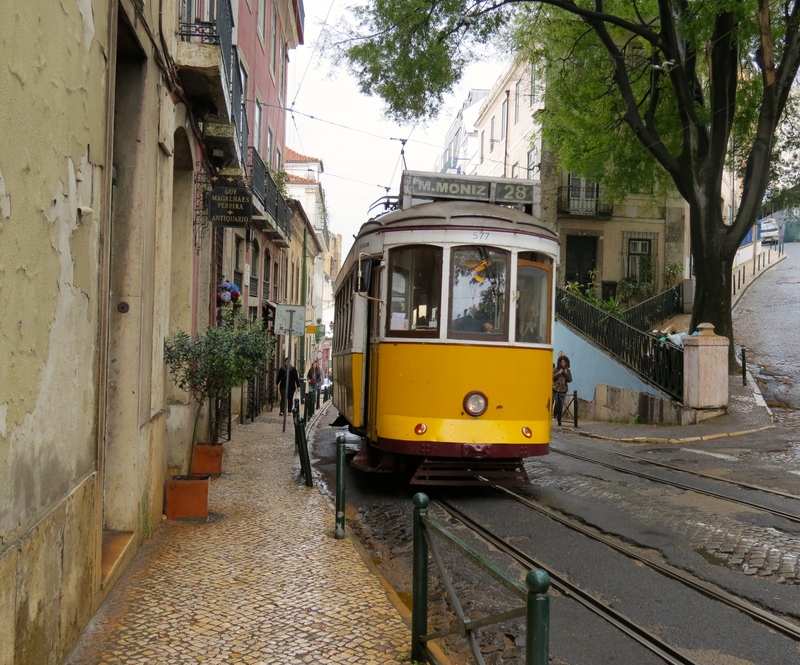 . . . .
A photograph of a little yellow tram-car against the backdrop of a twisted alley way on a cobblestone street, enticed me to visit Lisbon. 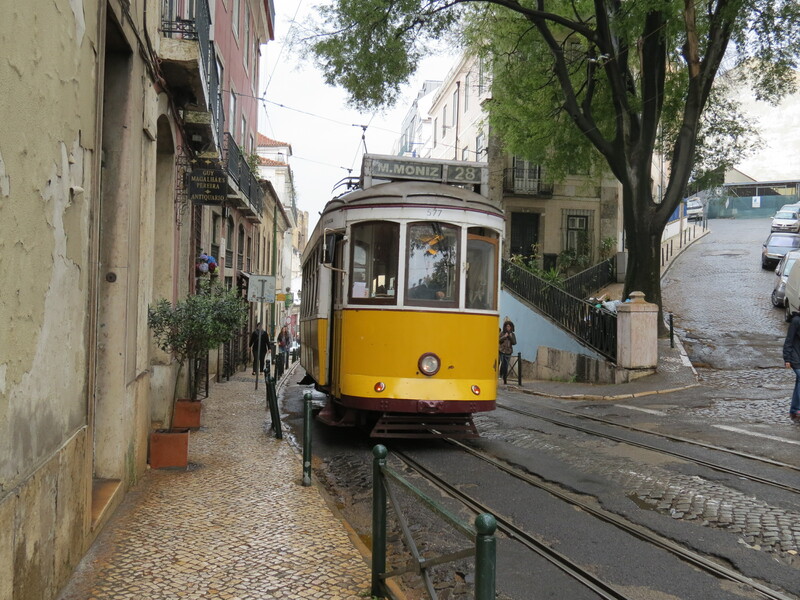 National Geographic lists the Lisbon trams in their top ten list of trolley rides. 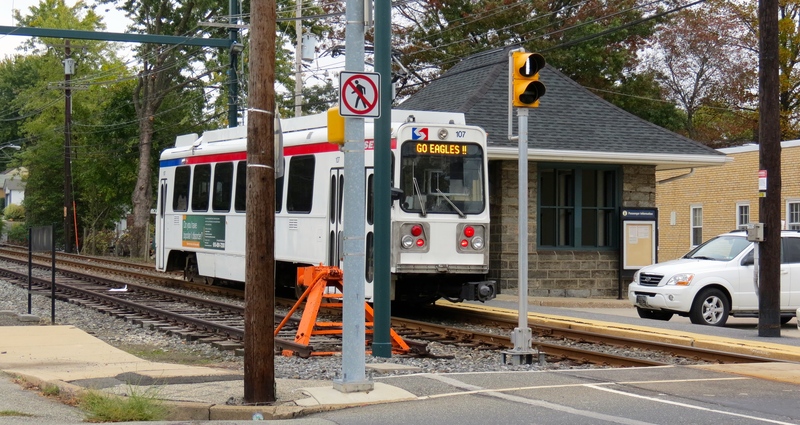 I have an affinity for trolleys because I grew up next to a the Red Arrow Trolley Line that ran in the back of my childhood neighborhood; we always looked forward to riding the trolley. So when public transportation takes on a mystic quality, I know a ride is not to be missed. My experience with the hair-raising Amalfi Coast bus ride comes to mind. I always prepare references of places I plan to see and “visit” locations on Google maps still I didn’t find the right place to pick up the tram in the historic Amalfa section of Lisbon. I was proud of myself for negotiating a metro transfer and arrived at the Martim Moniz Plaza only to stand a station for 20-minutes, wondering if I was lost. A man wearing a transport vest looked like a good candidate to set me straight, and he affirmed I was in the right place, but the next tram that stopped was the Number 12 not 28! I decided to explore around the plaza, turned the corner . . .
Ah, yes, I should have scouted out the stop with the long queue. I thought a rainy day in April would be safe bet against hoards of tourists. 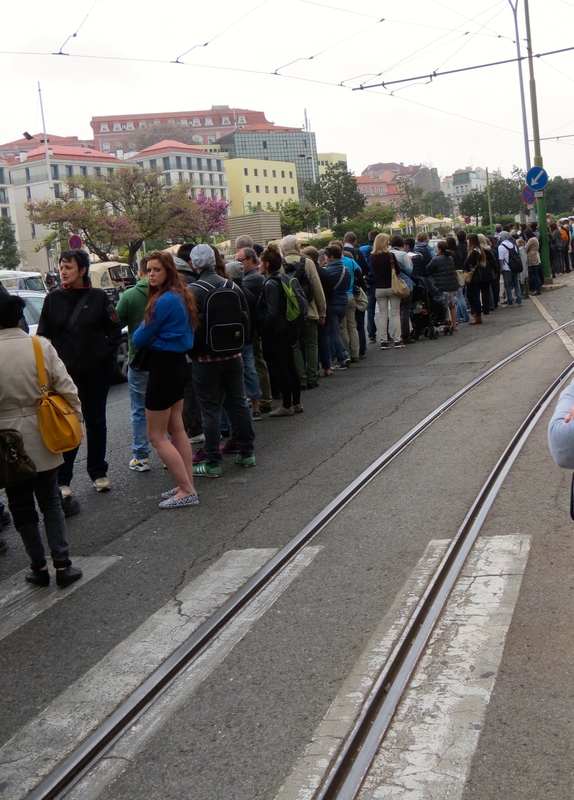 As rain intensified, everyone, including myself, stood our ground as we waited patiently for the trams to arrive until we, too, could be squeezed into the trolley car. Many of the guidebooks warned against pickpockets, but with cacophony of foreign languages and folks holding city maps while taking cell phone photos, there was no room for pickpockets . . . just hawkers selling umbrellas at inflated prices. The Lisbon trams, once drawn by horses, have a steampunk quality, with their 20th century fittings and polished wood. The vintage cars, built over seventy years ago, sport bright yellow paint. The narrow cars jounce (made up word) through cobbled streets and narrow alleys, like Mr. Toad’s Wild Ride from Disneyland–with sudden turns, avoiding what would seem to result in an inevitable crash. The tram wheels, positioned at the center of the car and not at the ends, make the trolley seem to float over the tracks. I stayed on the trolley, with a mysterious transfer to another, to the end of the line. I never did quite figure out their system, but did reach the last stop, the Prazeres, for my verified “Dark Tourism” experience. Ironically named “Cemetery of Pleasures,” the spot has an otherworldly feel, the rainy day contributing to the misty atmosphere. Lines of cyprus trees stretched toward the sky, breaking up the line of marble buildings. This cemetery reminded me of our visit to the Cimetiere Du Pere-Lachaise in Paris, where many of the rich and famous found their last resting place. Seems like Europeans like to create stone villages to the dead, perhaps trying to create immortality in stone. 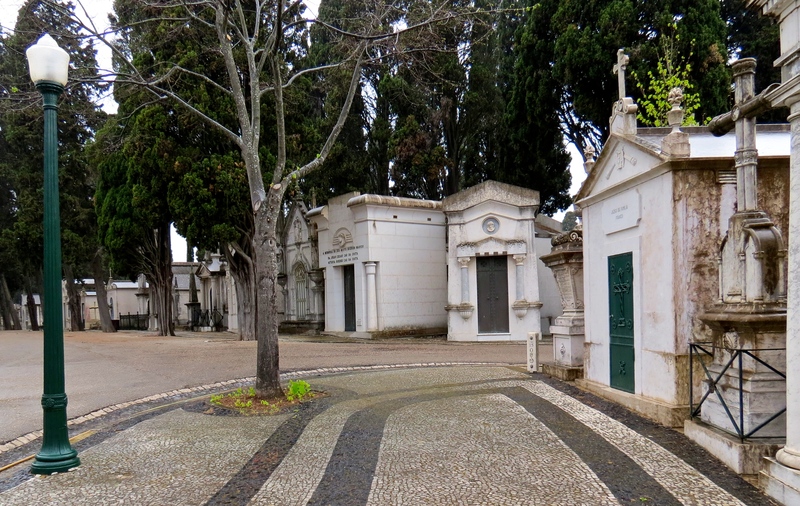 Each mausoleum is characterized by its own personality, with a variety of sculptures decorating the façade. Elaborate doors served as the entrance, either painted or with intricate ironwork in front of a window. Each building has a strange quality of enticing visitors to look into the little houses while still conveying an eerie caution. I couldn’t help but peek through the windows to see alters with pictures, as well as the coffins. I would have lingered longer, but as the rain spilled over my umbrella, the bone chilling dampness, no pun intended, drove me back to find the trolley. The trolleys stop at over thirty locations, and I found it challenging, if not impossible, to figure out exactly where we were at any one time. I did have a list of stops, but small print named the stations names and the conductor did not make announcements. In any case, every stop along the way seemed like a great place to get out and explore so it didn’t matter about missing the stop for Castelo de S. Jorge. The massively huge castle, which dates back to the 11th Century, sits atop the tallest of Lisbon’s seven hills. A shaded courtyard spread out toward expansive views of the city and surrounds, providing a great perspective of the area. The Tagus River, sparkling in the sun, surrounded the landscape. The massively huge castle, which dates back to the 11th Century, sat atop the tallest of Lisbon’s seven hills. 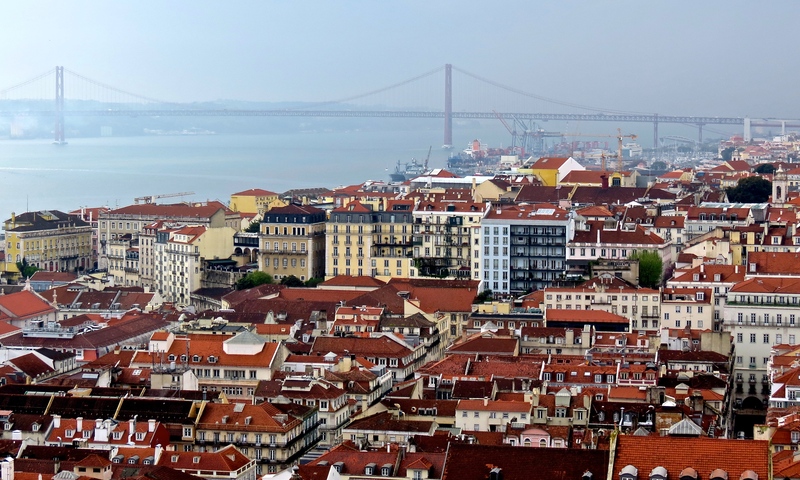 A shaded courtyard spread out toward expansive views of the city and surrounds with the Tagus River, sparkling in the sun, surrounding the landscape. Viewing from the ramparts, I looked down into the neighborhoods of Alfama. Cottages and castle stand together as extreme contrasts in size and style. I walked up and down the steps of the ramparts, being careful not to lean too far over the short walls. Steep steps provided a workout, but with so many interesting places around every corner, I wanted to see all of it. At the archaeological site, I viewed the ruins of the Moorish quarter. Before the Moor invasion, other civilizations occupied the site dating back to the Iron Age. 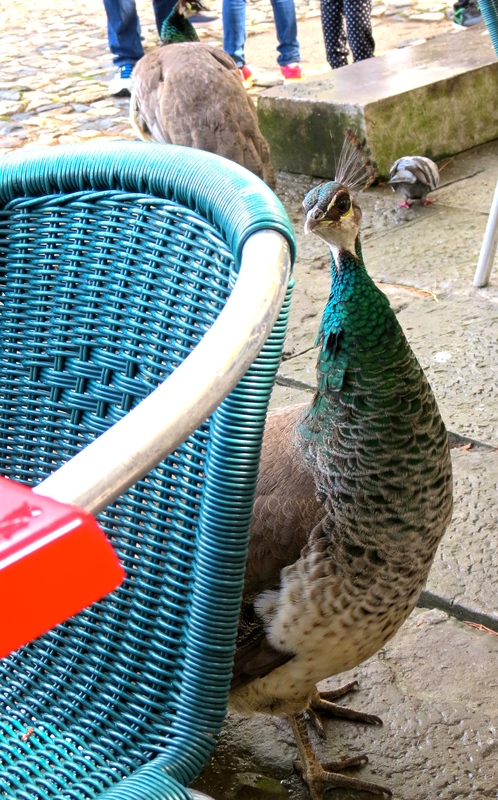 Peacocks and pea hens sat in the trees and on the walls and paraded around the café. I don’t believe I’ve ever seen peacocks of such size. When the male spread his feathers, he needed at lease ten feet. I bought a baguette for lunch and settled down at an outside table. Can you enjoy a meal while being watched? A peahen took an interest in my sandwich, cocking her little head as I tried to dissuade her with a conversation littered with, “no, no.” Being a Portugese bird, my words did not translate, but being a persistent creature, she was eventually rewarded with a handout, which worked for her and provided me with the knowledge of why these birds were so large. I hopped back on the trolley and then the Metro to my hotel. 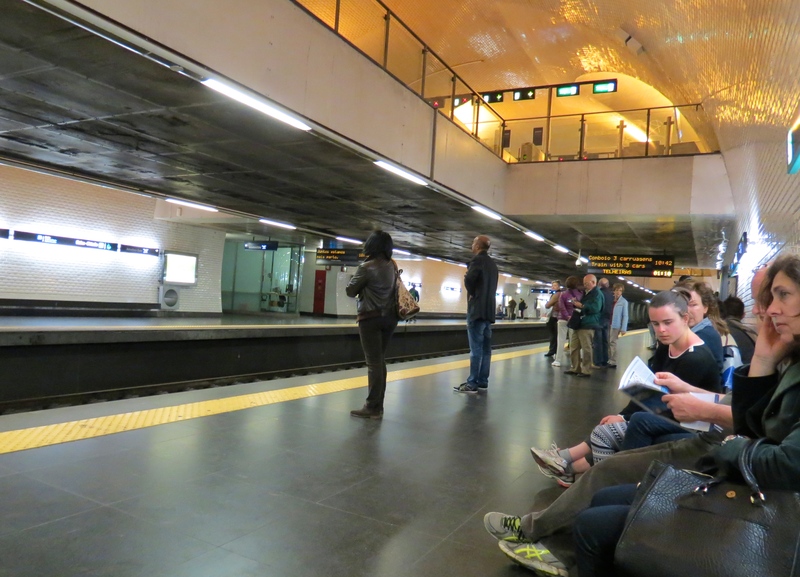 Lisbon’s Metro had been easy to negotiate and surprisingly spiffy and clean. Shiny blue tiles lined the walls along the series of escalators that carried passengers to lower levels. Not a single piece of paper littered the floors. Crowds jammed into the cars at rush hour. A fist fight broke out right in front of me, the result of pushing and shoving that jostled the passengers caught in the crush. A women on the platform broke the fight up, leaving the two agitators apart as the doors shut on the car and separated the two.